Epson XP-352 is a stylish and neat-looking small-in-one that offers a wide range of attractive features to home and small office users. The machine support wireless connectivity with WiFi and WiFi Direct supports Cloud printing, email printing and even allows users to print directly from memory card. The printer weighs 4.3 kg and measures 390‎ x 300 x 146 mm. It offers a printing speed for draft mode up to 33 ppm whereas for colour mode 15 ppm. The printing resolution of 5760 x 1400 dpi enable printing detailed colour photos with lab-quality and finish. Additionally, a 3.7 cm LCD screen provides a preview option for pictures further enhancing the printing experience. The Epson XP-352 ink cartridges have a separate installation configuration that allows users to replace only the ink that runs out. A flatbed scanner supports high-quality scanning with a resolution of 1,200 DPI x 2,400 DPI (Horizontal x Vertical). The maximum input capacity of the printer is 100 sheets. As the machine is even integrated with basic features like USB, it can be connected with Windows and Mac operating systems for a wired printing experience. 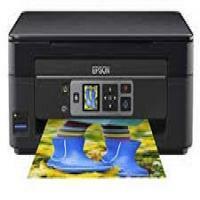 Epson XP-352 provides high-quality printing, scanning and copying with a compact design. The small-in-one allows users to print on-the-go using Google Cloud or simply connect to WiFi or WiFi direct and print clear and crisp photos and documents for professional, domestic or educational purpose. So, be it a small office or home this device can easily meet most of the important requirements easily provided that ADF, Fax and Automatic Duplexer are not a priority. How to reduce the operation sounds in Epson XP-352 printer? To reduce the loud operation sound, enable quiet mode. This may affect the printer operations. The printer operation slows down by enabling quiet mode. Click start menu and open control panel. In the control panel, select devices and printers. In devices and printer, select the printer and view its properties. Access printer driver window and select On as the quiet mode in the main tab. From the main menu select system and preferences. In the printer and Scanners (or print, scan & fax) select the printer. In the printer utility window, select on as the quiet mode setting. How to conserve black ink when the ink level of Epson XP-352 ink cartridge is low? When the black ink is about to get expended, and there is enough amount of colour ink remaining in the cartridge then you can choose for “conserve black ink” option. This feature is available only for the window Users, not for the Mac Users. When the Epson XP-352 ink cartridge ink level is low, Epson Status Monitor 3 will display a message to conserve black ink. Click Ok to continue. Each time you print, this message will appear until the ink level in black ink cartridges is low. Click devices and printers and select your printer. View properties and access printer driver window. Select the paper type as plain paper. Select the quality as standard. Enable the Epson Status Monitor 3. Click more/extended settings in the maintenance tab and select Enable. The composite black colour in the printout can be slightly different from that of the original black. A small quantity of Black ink is utilized to avoid clogging at printhead. It is recommended to soon replace the Epson XP-352 ink cartridge with the new one. Q. What is the benefit of having individual slots for inserting the ink cartridges into the printer? A. Individual slots for the ink cartridge means that you only have to replace the ink cartridge of the colour that is empty and not all the ink cartridges. This leads to less wastage and also results in long-term savings. Epson XP-352 printers come with this feature which allows the user to replace only the Epson XP-352 ink cartridge of the coloured that is exhausted. Q. How do I check the amount of ink remaining in the cartridge so that I can keep a replacement ready to avoid any disruptions while printing? A. A message will be displayed to you when the ink levels of the cartridges are running low so that a replacement is ready for the same. You can also check the ink levels of your Epson XP-352 ink cartridges on the LCD screen of the printer. Select “Setup” using the left and right arrow keys and then choose “Ink Levels” and then click “OK”. A graphic displaying the remaining ink in all the cartridges is displayed on the screen. Q. Do you also provide paper on your website? A. Yes, we also sell a variety of paper media that you can use to print on with your printer. You can find the whole list here. Just make sure that the paper you wish to buy is compatible with your printer. Q. My printer advises against the use of compatible ink cartridges and the printer warranty does not cover any damage caused due to compatible cartridges. Is it true that my printer warranty will be invalidated once I install compatible Epson XP-352 ink cartridges in the printer? A. No, the printer warranty remains valid even after the installation of compatible ink cartridges. However, it is true that damage caused due to compatibles will not be covered under the warranty policy. You do not need to worry about any damage caused to your printer when using our compatible ink cartridges as they are of high quality and will provide you with a hassle-free printing experience.